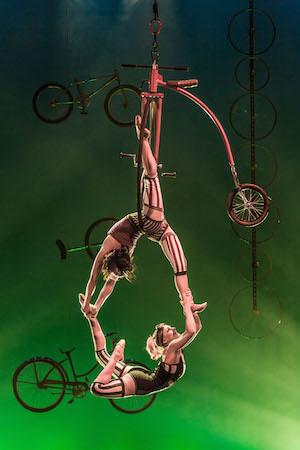 American circus group Cirque Mechanics will perform the daredevil antics and mechanical wonders of their show Pedal Punk at Smothers Theatre in Malibu on Friday, January 13, at 7:30 PM. The story follows a zany bike shop mechanic as he repairs more than broken bicycles, creating wondrous machines that come to life. At the center of the action is The Gantry Bike, a giant playground on wheels, on which a cast of acrobats, clowns, contortionists, trampolinists, aerialists, BMX bike tricksters, jugglers, and unicyclists amaze the crowd with their spectacular routines. Creative director and Cirque Mechanics founder Chris Lashua spent most of his career on a BMX bike and inside a German Wheel. The synergy between man and machine, the hallmark of Cirque Mechanics, is magnificently exposed in Pedal Punk. Cirque Mechanics, although inspired by modern circus, finds its roots in the mechanical and its heart in the stories of American ingenuity. The shows—rooted in realism—display a raw quality rarely found in modern circus that makes their message timeless and relevant. The stories are wrapped in circus acrobatics, mechanical wonders, and a bit of clowning around. Cirque Mechanics' first show, Birdhouse Factory, was produced in partnership with the Circus Center of San Francisco and the Pickle Family Circus, where it opened to stellar reviews. Birdhouse Factory went on to tour the U.S., with a critically acclaimed run at Broadway’s New Victory Theater in New York City. After this success, Cirque Mechanics quickly established itself as a premiere American circus, with its unique approach to performance, inspiring storytelling, and innovative mechanical staging. Cirque Mechanics launched their second production, Boom Town in October of 2010, presented in partnership with the Broadway Center for the Performing Arts in Tacoma, Washington. Ticket prices range between $20 and $40, and are required for attendance. For additional information about the performances, and to purchase tickets, visit the Center for the Arts website.